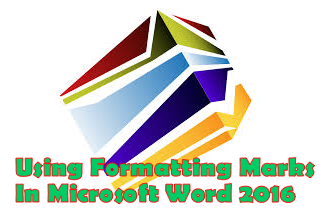 Formatting marks are marks or characters which are by default invisible to a MS Word 2016 user but these marks is what determines the layout of the document. Thus, these marks are what is used to troubleshoot any printing problem of the document whereby the appearance of the document in the computer's monitor will be different from the document's appearance when printed. Click the Show/Hide ¶ command button in the paragraph group. To Hide them, click on the Show/Hide ¶ command button again. Press Ctrl + * (i.e. Ctrl + Shift + 8) to unhide or show the formatting marks. Press Ctrl + * again to hide it. ¶ Paragraph or Pilcrow is used to specify the end of a paragraph. ¤ End of Cell Marker is used to specify the end of a cell in a table. Line Break is used to the start of the next line is as a result of line break and not that the previous line is the end of the paragraph. Space Seperator is the dot between the A and B, it is used to specify that there is a space applied between words. etc. Even without you unhide formatting marks so that is can start showing, Word 2016 gives you the option to specify which formatting marks should show and not show. Select Display in the left section of the Options dialog box. Under Always show these formatting marks on the screen, check the boxes for any formatting marks you want to see even when Show/Hide is turned off.